Older interlinears have the interlinear text in an old typeface, sometimes hard to read, and are based on the Greek New Testament of 1952 (Nestle-Aland 21st ed.). The English is stilted and awkward. 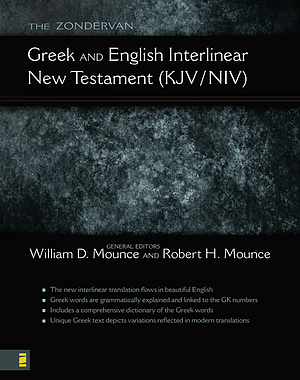 This new interlinear has Mounce’s own formal equivalent translation as the interlinear English text, and by use of the GK numbers and a series of arrows and asterisks, relates the Greek words to this English text. The KJV and NIV text run in columns on either side of the interlinear text for easy comparison of Greek text and modern translation. By careful spacing and with computer technology, both the interlinear text and the translation text run full length on the page. Interlinear New Testament: KJV English - NIV English - Greek by Robert Mounce; William Mounce was published by Zondervan Academic in March 2008 and is our 20930th best seller. The ISBN for Interlinear New Testament: KJV English - NIV English - Greek is 9780310241645. Be the first to review Interlinear New Testament: KJV English - NIV English - Greek ! Got a question? No problem! Just click here to ask us about Interlinear New Testament: KJV English - NIV English - Greek .